Deutsch provided architectural design services for the renovation of an existing building with improvements that included all areas to meet current ADA requirements. These areas included offices, restrooms, exam rooms and the pharmacy area. Bank of America, Countrywide, and Chase have occupied this building for the past twenty years. The design included a full exterior upgrade, and site improvements. The new owner had us complete all interior improvements, including increased exterior glass heights and modified the main entry way elevation. The parking garage increased parking to seven spaces per 1,000 SF, and added a lobby/leasing area and interior courtyard for a centrally located gathering space. Deutsch provided architectural design for this design/build LEED Silver administrative facility of a water reclamation plant. Our team explored creative ways to reduce lifecycle costs for the plant, while providing Class A office space. 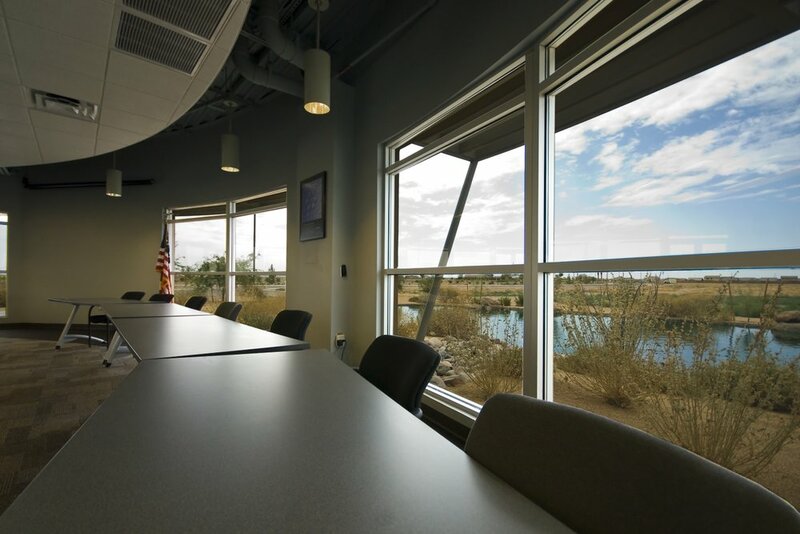 The Center will be the first in Pinal County to have LEED recognition. Deutsch won a Valley Forward Crescordia award in the category of Environmental Education/Communication under the private sector. Deutsch was also given an award of merit of Industrial and Public Works under the Building and Structures category. Deutsch completed a two-year long campus master plan to evaluate the various functions within the 18-acre Herberger Campus. The design was for a state-of-the-art 40,000 SF administrative facility for the TSA Headquarters and a social service building for their mission outreach. The social services portion was four separate buildings – an administrative building, a homeless shelter, a domestic abuse and daycare facility, and senior housing. The four buildings totaled 34,700 SF are linked with covered first and second-floor walkways to create a campus atmosphere. The project includes a full-service commercial kitchen, a playground and with a splash pad feature, and the remodel of the existing 23,000 SF warehouse. Interior modifications also include a new volunteer break area, a maintenance office, and shop area. Deutsch helped this client realize their vision of a 45,000 SF professional plaza. The site at the corner of Cooper and Guadalupe Roads offers 20,000 SF of office space and 15,000 SF of retail condos on an existing 5.2 acre site. Our goal was achieved in designing the most effective multiple office and retail condo complex for this market.